Some more detail photos of Rafael's frame, the head lugs are Llewellyn slant six lugs that I added the circular cutouts to. 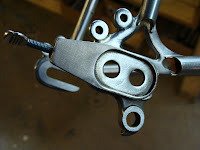 You can also see the internal brake routing and my handmade down tube cable stops. 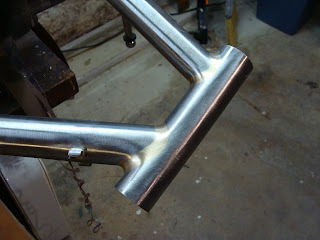 The seat lug is also carved a bit to match and Rafael requested the fastback style seat stays. A little shot of the brake bridge, it's milled out on the under side for less weight, maybe a couple grams, but it looks cool. The Ellis dropouts, I left the surface under the chain stay a little raised rather than blending it into the chain stay. I finished this into a point and had Jason leave it unpainted so that it won't be chipped when the wheel hits this surface during wheel changes. 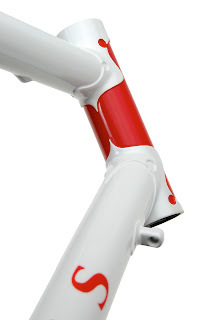 Rafael has promised photos of the completed bike, I'm looking forward to seeing it finished! 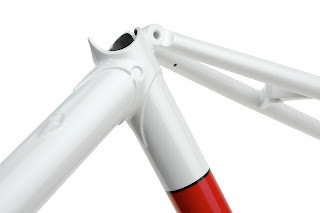 Here's the first couple of shots of Rafael's new frame. He wanted a sloping top tube, so I used the Llewellyn slant six lugs for over sized tubing and did a little customization. He also chose to do the Ellis dropouts, and I finished them a bit differently this time around. I should have some close ups soon. I didn't notice until my wife mentioned it to me, but I passed a bit of an anniversary this past week. It's been a year since I left Waterford. I've been thinking more of the upcoming anniversary of Ellis' incorporation, but it did get me thinking about all the things that have happened over the past year. 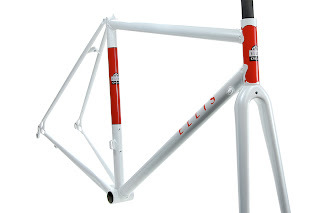 Here's to a great 2009 and many more miles for Ellis Cycles! 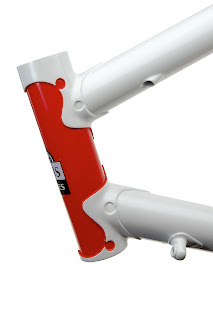 A friend of my recently talked to me about building a 29er frame that would double as a touring bike. I did some drawings with his specs and it piqued my interest in a similar project. I haven't had a mountain bike since I sold mine 4 years ago, and I've never really had a touring bike. this seemed like a bike that could fill both needs without filling the garage with 2 bikes that might get a minimum of use. 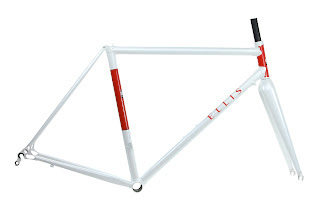 I spent some time researching 29er and touring geometries and I think I've come up with a nice blend for this frame. The next step was deciding on parts, disc vs. cantis, and other bits. I finally settled on canti's and also found a slick way to use Campy long slot dropouts so this bike could be run as a single speed. In fact, I plan to display it at the NAHBS that way. 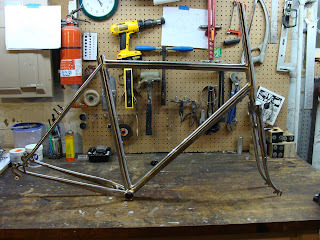 OK, here's the frame and fork. 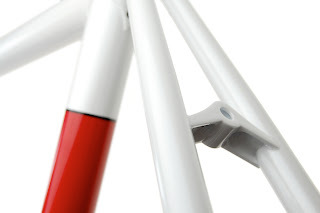 I love the shape of the Pacenti fork crown, plus it allows for the classic raked fork. If you look under the crown you'll see my tricky fender mount. I may not use it often, but it'll come in handy if I ever need it. I also added rack mounts for versatility if I ever tour on this bike. I wanted to have as much clearance for fat mountain tires as I could get. I mocked up the chain stays and spent some time deciding exactly how wide I could go. 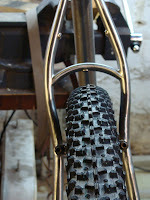 The seat stays are 16mm double tapers that I custom bent. 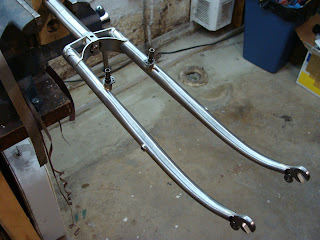 I also made a small bending fixture for my seat stay and chain stay bridges, both of which also have fender mounts. Fillet bottom bracket, always a joy to finish... I also added the little cable guide under the chain stay to get the cable past the bend without snagging on the knobbies. 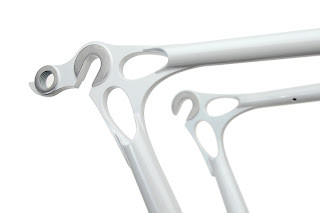 Here's the retro dropouts. I sized the chain stays so a 2.3 tire just drops out before hitting the seat tube. I also made sure the slot was as close to perpendicular to the seat stays as possible. Now when the wheel is moved back and forth in the slot it doesn't affect the brake pad position. 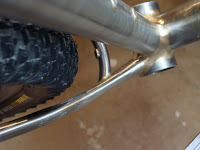 Finally, I modified a Surly Tuggnut to tension the wheel with these dropouts. 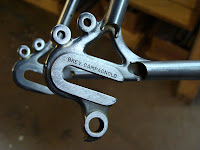 The screw countersinks into the existing hole on the Campy dropouts. 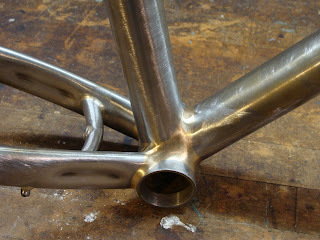 Finally the fillet brazed head tube. I played around with removable cable guides for when I run the bike as a single speed, but I finally decided to just add a couple split guides on the down tube. Not super clean, but functional. Now I just have to decide on the color... Any ideas?